Welcome back, readers! Today we’ll be gushing about a new 3D printer that we’ve had the wonderful opportunity of working with and that, we have to say, were extremely impressed with! The M3D Micro 3D Printer, which holds the title of the largest 3D printer Kickstarter ever, is such an exciting and accessible technology that we couldn’t wait to share our experiences using it with all of you. The Micro 3D printer is designed with the consumer in mind and strives to make 3D printing more accessible. Here are some things that set it apart from other desktop 3D printers on the market today. With a retail price of $350, it is the first 3D printer to be affordable for the average family, and we can see it becoming a must-have in every household. Compared to traditional 3D printers, which typically burn over a thousand dollars in your wallet, the Micro prides itself on reduced power consumption, making it even more affordable to use for both home and business applications. Its small, compact size makes it convenient for the smallest indoor spaces as well as for travel (it’s perfect for trade shows, maker faires and other events that require you to demo a 3D print). We were very impressed with how easy and fast it was to start 3D printing. Installing the software takes about 5 minutes, and it’s even easier with the YouTube tutorial that’s included in the package. Let’s say you can’t wait to print something but you don’t have any digital files yet. Well, the Micro comes with a library of designs—including useful household items such as small cups, doorknobs and other replacement parts—all of which are immediately accessible for even the beginner users. All you need to do is push a button to see your desired object begin to take form. What’s more, the M3D software is also compatible with digital file sharing marketplaces like Yeggi and Thingiverse, making the scope of accessible designs even larger. The M3D software is compatible with any Windows, Apple or Linux operating system. 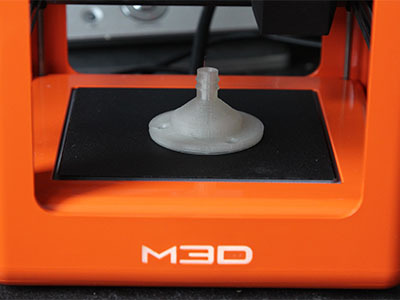 M3D’s Micro also has a myriad of uses for the more experienced user, and we were very impressed with how comfortable it was for us to import our own digital files from other 3D-printing software. The Micro is compatible with all basic 3D-printing file formats (STL, OBJ…) and is thus compatible with basic design software such as Google SketchUp as well as more complex design software like AutoCAD. It also allows for the basic alteration of designs, such as tweaking the height, positioning and scaling of an object, as well as more advanced functions, like flow rate and temperature tweaking. Finally, the quality of the prints produced by the Micro is easily comparable to the quality you get from a 3D printer four times its price. Not to mention, the printing process is smooth, quick and glitch-free. Here’s a look at our first prints using the M3D Micro 3D Printer. The Micro has the power to finally make 3D printers a staple in every household—and that makes us extremely excited for the future of 3D printing. 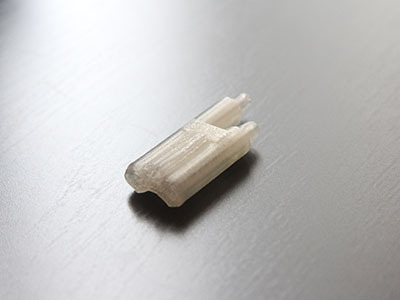 To see the Micro 3D printer in action, check out our time lapse 3D print of the 3Dponics conduit. And, as always, be sure to keep in touch!